Never will you find more cutting-edge RF and microwave technology on display in one place than at the IMS Exhibition. 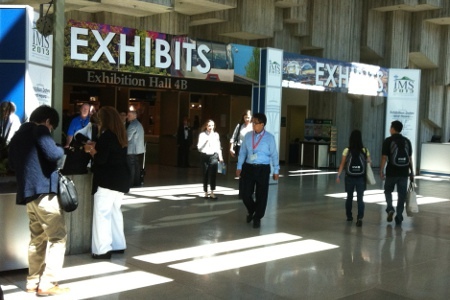 Hundreds of component manufacturers, chipmakers, instrumentation suppliers, software developers, and other technology companies fill the IMS exhibit halls, showcasing tens of thousands of products, many of which are making their first public appearance. It’s a place where design engineers (and editors) can see something they’ve never seen before, a place where the fundamental research discussed in the IMS technical program ultimately finds its practical application. Straying outside the traditional application boundaries of IMS (communications, radar, etc. ), NXP Semiconductors showed how its new line of RF power transistors can be used to precisely control the delivery of power and energy in a growing range of industrial, medical, automotive, and other uses. These 28V LDMOS-based transistors operate in the 2.4 GHz ISM band and offer efficiencies of >52% and power levels between 12 and 350 W. Demonstrations of this technology at the NXP booth were fascinating — an RF plasma lamp emitting 140 lumens/W, a solid-state cooker with three times the efficiency of conventional microwave ovens, and an RF spark plug that reduces fuel consumption by 10 to 15%. Watch these demos in our video below, and check out NXP’s video for additional application examples. While I didn’t technically see it on the IMS exhibit floor (I got a private introduction in a hotel meeting room across the street), I thought X-COM Systems’ VSG5000A vector signal generator was noteworthy enough to include. The instrument enables you to realistically simulate active phased-array radar, EW, military communications, MIMO, and other systems in increasingly complex RF environments by playing back real-world signals captured, recorded, and analyzed by X-COM or other COTS equipment and software. Available in 50 MHz to 3 GHz and 6 to 18 GHz models, the VSG5000A includes four independent RF signal generators each with 110 MHz of bandwidth (440 MHz total) and four solid-state waveform memory modules (each providing at least 50 min. of recording time) in a 4U chassis, at a fraction of the cost of alternative approaches. Skyworks launched the SKY67151-396LF GaAs low-noise amplifier at IMS2013. The new LNA covers a frequency range of 0.7 to 3.8 GHz and delivers noise figures as low as 0.25 dB (in evaluation board measurements), which Applications Engineering Manager Alan Ake told me is about 0.1 dB better than the previous industry leader. The device operates in conditions up to 105° C, and its supply current can be externally adjusted to optimize linearity. It can be used to boost weak incoming signals in 4G infrastructure like macro and micro cellular base stations, cellular repeaters, remote radio heads, and tower-mounted amplifiers. Skyworks also believes it is well suited to L- and S-band military communication, GPS transceivers, and proprietary radio networks. Ake discusses the device in further detail in the video below. Rohde & Schwarz demonstrated three impressive new capabilities for its flagship R&S FSW signal and spectrum analyzer. For one, its bandwidth was doubled to an industry-leading 320 GHz, making it useful for analyzing radar signals with wide bandwidths or extremely short pulses. In addition, its frequency range was increased to 50 GHz, expanding its application to the testing of transmitters and components for radar, SATCOM, and military communications systems. Finally, it gets real-time spectral analysis (RTSA) capabilities, which enables it to detect short, sporadic events (e.g. frequency hopping radios) and provides an alternative to RTSAs offered by Tektronix and Agilent. For more on the FSW’s new features, check out the video below. 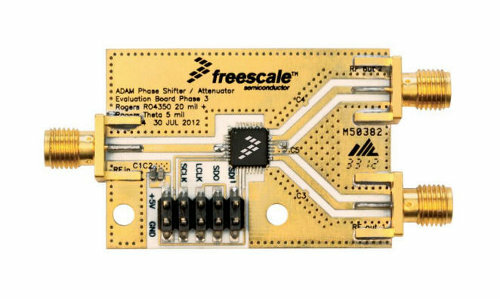 Another “first” we saw at IMS2013 was the new MMDS20254H advanced Doherty alignment module (ADAM) from Freescale Semiconductor. This GaAs MMIC control circuit allows users to more accurately align phase and amplitude of signals amplified by the carrier and peaking sub-amplifiers of asymmetrical Doherty amplifiers (specifically, Freescale’s Airfast PAs), thereby improving overall performance and power efficiency. Users can digitally adjust ADAM to optimize PA performance under changing power level, supply voltage, and temperature conditions. The device incorporates a coupler, digitally selectable phase shifters, and step attenuators, and is suitable for W-CDMA and LTE base stations operating in frequencies from 1800 to 2200 MHz. Empower RF Broadband had its latest breakthrough — a 1 kW broadband amplifier in a 5U chassis — up and running at its IMS booth. 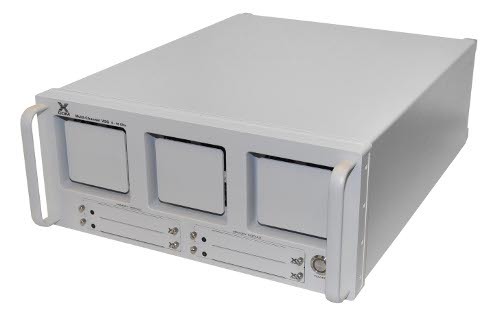 Intended for applications like electronic warfare (EW) and test and measurement, the new air-cooled HPA covers the frequency range of 20 MHz to 1 GHz and is surprisingly quiet. (You can hear the significant difference between this unit and its predecessor by comparing the sound on the video below with last year’s version.) President and CEO Jon Jacocks told me that Empower RF engineers achieved this unique combination of size and performance through careful attention to thermal management and new control/monitoring software. See (and hear) the amplifier in action, and learn how it can be controlled via a wireless device (in this case, an iPad), in the video below. As the mobile infrastructure buildout transitions from macro cells to small cells, space is (obviously) at a premium. As a result, the components that make up these base stations have to shrink along with the overall system. CTS Electronic Components has design the latest generation of its ClearPlex waveguide ceramic filters to address this very trend. The new filters provide performance comparable to traditional air cavity filters — 1.8 to 4 GHz frequency range, <2.5 dB insertion loss, sharp rejection points up to -80 dB, and PIM levels of -110 dBm average — but at a fraction of the size (63.5 x 38.1 x 12.7 mm or smaller) and cost. (The obvious tradeoff is output power.) ClearPlex can also offer bandwidth benefits, since the filters can be stacked. For more on this groundbreaking technology, view our video from IMS2013 below. Obviously, this is just a small sample of the innovative technologies that made their debut at IMS2013. Did you see or hear about any others that you think should have made the list? If so, please share your thoughts below.